Some people make a ton of money by investing in the stock market, and of course there are others who lose their shirt. The people who do well have an approach that allows them to gracefully navigate the unpredictability of the market and come out ahead. This approach translates surprisingly well to navigating the unpredictability of promoting a stage production. I was talking on the phone earlier this month to an experienced marketer and actor (a combination near and dear to my heart) who wanted to redirect her career path to helping performing arts companies market their productions. One of the topics that came up was how to explain the benefits of spending money on marketing to someone who doesn’t get it. 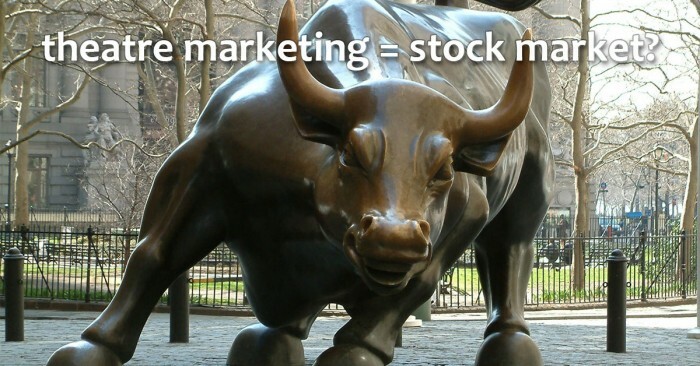 We stumbled upon an analogy that I find very suitable: Investing money in your marketing is like investing in the stock market. If I decided to invest all the money I had into a single stock that I had just started reading about, I would be met with more than a few raised eyebrows. Rightfully so. The idea that I could easily, instantly hop into the stock market and pick a home run stock is absurd, but it’s a very seductive notion because one out of a million times it actually does happen exactly like that. It’s just as unlikely that you’ll be able to jump into theatre marketing and nail your first promotion right out of the gate. You have to educate yourself, develop relationships with good advisors, and understand what motivates people to spend their hard earned dollars – just as you would need to in order to have consistent success investing in stocks. That’s not how you start out, but you can get there. Because this is the Internet, I should probably point out: I am not a stock broker, but I may sound like one when I tell you that your approach to theatre marketing needs to focus on diversification and investing for the long term. You can lower your risk by consistently and thoughtfully expanding your arsenal of marketing tactics. This is part of the reason I say you should be trying at least one new thing with every show you promote. Look at the data about which tactics are working, keep the winners, and cut the dead weight. There are a lot of factors that affect people’s decision about how they are going to spend their Friday night – most of which are not in your control. Bad weather, unexpected bills, local sports teams going to the championship, car trouble, what’s playing at the cinema, and a hundred other factors play into someone’s decision about whether or not to buy a ticket to your show. There are certainly things you can do to market when there’s big competition, but even your best marketing effort could result in a meager box office take if the stars are aligned against you. People who are consistently successful in the stock market don’t change their investment strategy based on the ups and downs of the economy, and that holds true in theatre marketing, as well. You should be consistently and methodically promoting to build a long-term awareness of your work. The term for this in the Marketing™ world is branding. You can’t just wait to pour marketing dollars into the one or two productions that are near and dear to your heart. Of course you can, but you’ll never get as much exposure and attention as the theatre who treats every production as an opportunity to build on their reputation in the community. I know in my heart that there are people (maybe some of you reading this right now) who shy away from marketing because it feels so random. Whether or not a crowd shows up to your show can feel like the flip of a coin – even when you do the marketing things you feel like you’re supposed to. It can feel like something that we have no influence over, so why bother even trying? It is worth it. You can’t use marketing to control human behavior as easily as flipping a light switch (thank heavens), but you can use it to influence people to come see more of your shows over the long term. By the way, please only use this power for good.